We live in a world where real-time communication is the norm; not the exception. Where immediate access to friends and family is no further than the devices at our fingertips. In this world, consumers expect brands to be available 24/7 and the easiest way to meet that expectation is by providing live chat support. Live chat is redefining the parameters of customer and company communications. Instead of traditional channels with long wait times—email and phone support—live chat compresses all the back and forth by providing the immediate support customers need, exactly when they need it. You could say live chat just happens to be in the right place at the right time, every time. For customers, live chat experiences are familiar, convenient, and secure. Interactions are in real time yet preserved forever for their records. There is no room for error from mishearing someone on the phone. For businesses, live chat is efficient and effective. Agents are able to help more customers in a shorter amount of time. They also collect valuable user data to help them solve issues more efficiently. From both perspectives, it’s certain that live chat has a place in today’s customer-centric marketplace. So instead of questioning whether chat is a useful channel, it’s time to ask: How do we get more value from live chat? Ready to start reading? 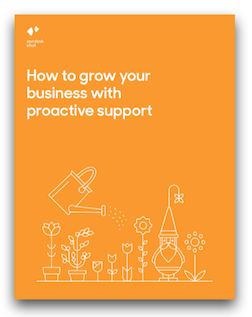 Here's your ebook link: How to Grow Your Business with Proactive Support.